For more than half a century historians have been obsessed with the supposed differences between radical and moderate Republicans on the slavery issue, but they’ve come up with nothing substantial. Ironically, this preoccupation with “finding the radicals” has the effect of marginalizing them, for it obscures the success antislavery agitators had in pressing their policy proposals into the political mainstream. Charlie Post says that whereas radical Republicans initially sought to “hasten the end of slavery” Lincoln and the moderates wanted to put slavery “on the course of ultimate extinction.” What’s the difference between these two positions? All Republicans — indeed, nearly all abolitionists — agreed that the Constitution did not allow the federal government to abolish slavery in a state where it already existed. To get past this constitutional restraint, antislavery advocates developed a number of policies aimed at surrounding the slave states and squeezing slavery to death — gradually. Radicals would “hasten” slavery’s demise by banning slavery from the western territories and abolishing it in the Washington, DC. Did Lincoln and the moderates object to these policies? Radicals would “repeal” the Fugitive Slave Act of 1850, whereas Lincoln would revise it to insure that it did not deprive anyone of the “privileges and immunities of citizens.” Both positions were based on the proposition that blacks were presumptively citizens, a position all slaveholders rejected. More importantly, both Lincoln and the radicals argued that if the South seceded the North would stop enforcing the fugitive slave act altogether. Again: Can Post name a specific policy, commonly advocated by antislavery radicals, that mainstream Republicans like Lincoln opposed? Post says the proof of the difference between Lincoln and the radicals lies in the first year of the war, when moderates “refused to turn the force of the Federal government against slavery in the South.” Nonsense. Lincoln’s cabinet swiftly approved General Benjamin Butler’s decision to refuse to return escaping slaves to their masters, within days of Butler’s request and less than two months after the war began. Post refers to “official instructions ordering Union military commanders to return escaped slaves to their masters.” I know of only one such “official instruction” to a single Union commander in July 1861, and Lincoln was so ashamed of it that he ordered his subordinates to make sure it could not be traced to him. From August 8, 1861, forward, the “official instructions” coming from Washington were to emancipate slaves coming into Union lines from rebel areas. Individual commanders on the ground sometimes returned slaves to their masters, but they did so in violation of official policy and at the risk of alienating their own men. Congress had come into special session in July 1861, five months ahead of schedule, and quickly passed a confiscation act that was designed to emancipate all slaves used in support of the rebellion. Lincoln signed the law and two days later his War Department issued the instructions for implementing it, immediately freeing the slaves at Fortress Monroe and, over the next several months, emancipating thousands of slaves up and down the southern Atlantic Coast. Recall what Lincoln actually instructed General Frémont to do in Missouri in September 1861: Rewrite your orders to conform to the First Confiscation Act. Fremont was prohibited from emancipating the slaves of rebels outside his lines; instead he was instructed to emancipate all slaves escaping into his lines from rebellious areas. In December Lincoln announced to Congress that under the terms of the First Confiscation Act “numerous” slaves had escaped to Union lines and were “thus liberated.” And so it went. By the time Lincoln issued his Emancipation Proclamation on January 1, 1863, the Union had been legally emancipating slaves for well over a year. I don’t say that there were no differences between Lincoln and the radicals. I do say that when it came to emancipation policy those differences were trivial. But the obsession with distinguishing the Radicals from the Moderates has played into the hands of neo-revisionist historians who, following in the footsteps of Avery Craven, continue to insist that “the abolitionists” were a tiny, marginalized group in the North and that most northerners “couldn’t care less” about slavery in the South. 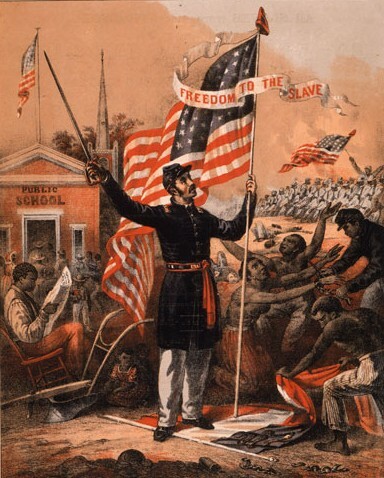 In fact, Republicans won overwhelmingly in 1860 by promising to put slavery on the course of “ultimate extinction.” But when the slave states responded to the Republican victory by seceding from the Union, Republicans shifted their ground and warned — openly and unapologetically — that secession meant war and war meant not gradual abolition but immediate, uncompensated military emancipation. That’s what Lincoln and the Republicans promised to do, and that’s what they did.